The Gudgenby Bush Regeneration Group (GBRG) was established in May 1998 to lobby for the complete removal of the Boboyan Pine Plantation in Namadgi National Park and to rehabilitate the area. Logging began in 1997 and, following a hiatus, the last piles of pine slash were burnt in April 2005, completing what the 2003 bushfires failed to do. The GBRG has regular work parties to replant native species and remove weeds and surplus fences. 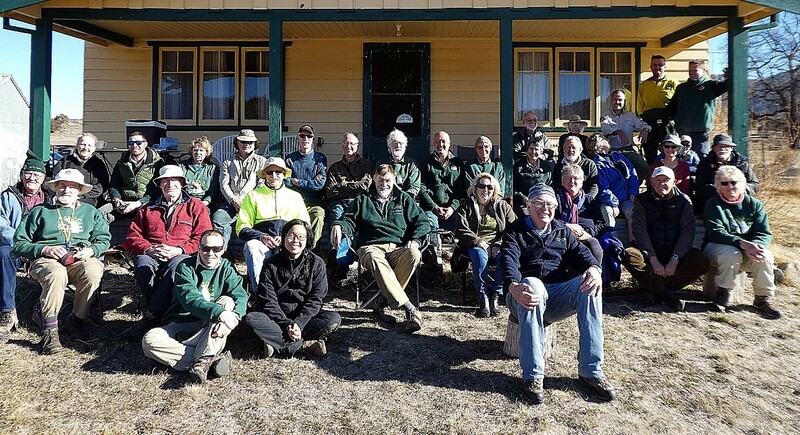 During 2018 our small but dedicated group of volunteers continued to support rehabilitation of the former Gudgenby pine plantation in the far south of Namadgi National Park through weed control, fence removal, water quality monitoring and related activities. Ten work parties were scheduled this year, one less than has been the case previously as we have found that the prevailing hot conditions in February and the potential fire risk limit what can be achieved in late summer. Fortunately weather did not intervene this year and all proceeded without disruption. Weed control at a range of sites in the Gudgenby Valley occupied the bulk of our efforts, comprising cutting and dabbing of hawthorn, blackberry and briars (as well as the occasional pine tree!) and chipping of verbascum and other such weeds outside the growing season. Removal of unsightly and potentially dangerous barbed wire from derelict fences in remoter parts of the rehabilitation area continued to require strenuous efforts in the colder months while the September work party was devoted to mapping the location, size and accessibility of warrens in the vicinity of Rendezvous Creek in support of a future rabbit control program by PCS staff. Monitoring of Bogong Creek, Hospital Creek and Little Dry Creek was again undertaken every second month by Martin Chalk and his team under the auspices of Waterwatch (on alternate months these creeks are monitored by Southwell Venturer Scouts.) The dry conditions of 2018 have affected each of these creeks. While Bogong Creek continues to be the most resilient of the three, Hospital Creek has had high nutrient and salinity levels this year. In the past, this situation has self-corrected after good rains. Little Dry Creek has lived up to its name and has had no flow since December 2017. The undoubted highlight of 2018 came in July when we gathered at Gudgenby Cottage to celebrate the 20th anniversary of our very first work party. Under clear skies on a cold but gloriously sunny day (very reminiscent of that first work party) twenty-two members, four former rangers, two current rangers, Park Manager Brett McNamara and two members of the public raised a glass to all those who had a vision of what the pine forest could become and have contributed to achieving that vision over the years. It was also an opportunity to remember those who have passed on, including former President Eleanor Stodart who was key to the group’s establishment, and long-serving members David Hall and Frank Clements. In the lead-up to the celebrations, PCS commissioned historian (and Gudgenby Bushie) Matthew Higgins to compile a history of the group and the rehab project, which is available on the NPA ACT website. Courtesy of PCS, two park benches have been installed in the valley, one at Hospital Creek (“Eleanor’s Grove”) and the other on the Yankee Hat walking trail. And last but certainly not least, the venerable GBRG trailer received a new paint job in bright green and is looking great! Another of the year’s highlights was revisiting a site on the north-western edge of the rehab area (“Croajingalong Slope”) for the first time in nearly three years. Blackberries and briars were few and far between and regeneration of overstorey and understorey was strong, indicative of the success of our previous efforts. Tackling small willows re-emerging along a neighbouring section of Bogong Creek is a likely focus of a work party in early 2019‑as all good bush regenerators know, repeated follow-up is the key to successful long-term weed control. At our AGM following the 20th anniversary celebrations, I took over responsibility as President from Michael Goonrey, who stepped down after 10 years in the role. As an original member I felt I was pretty familiar with the diverse range of activities undertaken by the group over those two decades however after a few months in the role I must admit to have gained a new perspective on all the ‘behind the scenes’ work that Michael and other committee members have handled so capably. Our best wishes go to Michael (and of course Christine) as they settle into their new home in the Bega Valley‑and we hope they will be able to continue to participate in the occasional work party as opportunities arise.